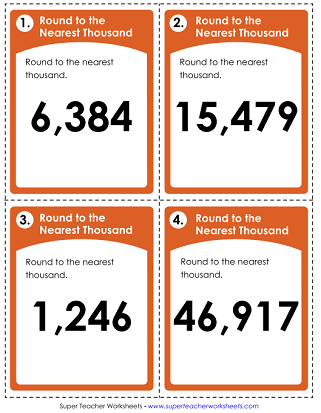 Here we have a selection of teaching resources that can be used to teach students about rounding numbers to the nearest thousand. Also includes nearest ten, hundred, and thousand mixed. Part 1: Round the numbers to the nearest thousand. Part 2: Strawberry numbers. Part 3: Add four numbers to the web that round to 8,000. Part 4: True or false. 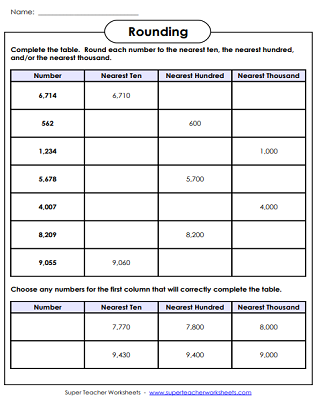 This page has a set of 3, 4, and 5-digit numbers that students will round to the nearest thousand. 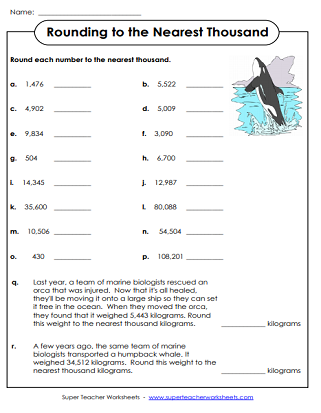 There are also two whale-themed word problems. Kids will begin this activity by using a cypher to decode sets of symbols into numbers. Then they'll round each number. In this whole-class math game, students will move around the room while rounding numbers to the nearest thousand. In this printable rounding activity, students will round to the nearest thousand to complete the rounding caterpillar. This file contains 30 task cards. Round 4-digit numbers to the nearest thousand. Use these cards for classroom games, small group instruction, morning work, or learning centers. Print out 30 task cards to use for small group instruction, peer tutoring sessions, classroom scavenger hunts, extra practice, or learning centers. This version includes 3, 4, and 5-digit numbers. Round each four-digit number to the nearest thousand. Why did the elephant quit her job at the circus? To find the answer to this funny riddle, students will round numbers to the nearest tens, hundreds, and thousands. Round numbers to the nearest ten, nearest hundred, and nearest thousand. Then solve the multi-step word problems. This worksheet has an exercise theme. Compete the rounding table by inserting the missing numbers. Round each number to the nearest ten, hundred, and thousand. These task cards require students to round to the nearest tens, hundreds, and thousands place. Practice rounding decimals to the nearest tenth, hundredth, and whole number. Jump to various levels of rounding worksheet, including tens, hundreds, decimals, and fractions.